Waterfall with a day trip, we visited the Dee Dote. 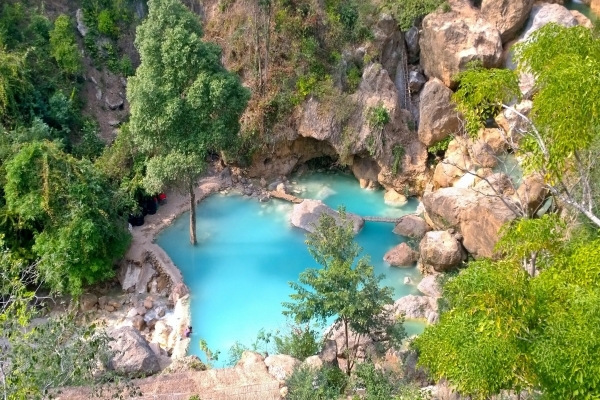 The waterfall can be reached comfortably from Mandalay from with the vehicle in ca 1.5 hours. For those arriving at the foot of the waterfall, it all with plastic is covered. The locals to handle so disrespectful of nature as I rarely saw it. The mountains of plastic and garbage lying around everywhere significantly reduces the experience. The ascent itself takes approx 30min and is feasible even for inexperienced users. The waterfall itself is less than assumed but beautiful (if as already mentioned not all garbage would lying around). Since it was rainy season just end with us, the water was Brown all the sediment and not blue as touted in the pictures. Conclusion: Really beautiful, if not so much garbage would be around. Drive to Dee Doke Waterfull and Mandalay Sightseeing.